On December 7, 1979 STAR TREK: THE MOTION PICTURE opened around the country with lines around the block at the theaters. So many fans had waited ten years for this movie and expectations were high. Rumors of difficulties with the story and special effects had been floating around before the film's release but the audience was primed to see it regardless. I was one of those people who stood outside the Mann's Chinese Theater for hours that December night in Hollywood. Although it was Friday and I didn't have to work the next day I finally bailed out around midnight and went home. I eventually got in on Saturday and found out what the faults in the film were first hand. The major complaint was the sluggish pace (critics nicknamed it STAR TREK: THE MOTIONLESS PICTURE and SPOCKALYPSE NOW) and stiff performances of the lead characters. As I found out later, part of the stilted delivery stemmed from the fact that many of the lines spoken on the bridge were dubbed. It seems that the visual displays on the panels were rear-projected with Super 8 and 16mm projectors clattering behind the walls. To eliminate these sounds, the voices had to be rerecorded later. Trying to maintain lip-sync and the emotional quality of the scene didn't work out very well. 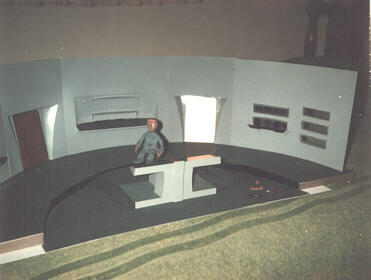 A limited amount of merchandise was produced for the movie including a new Enterprise model with interior lights. I carefully mulled over the idea of doing an update of STAR TRIX to spoof this new feature and eventually commenced set-building. I was keeping a cartoon diary at the time and duly recorded the fact in there. 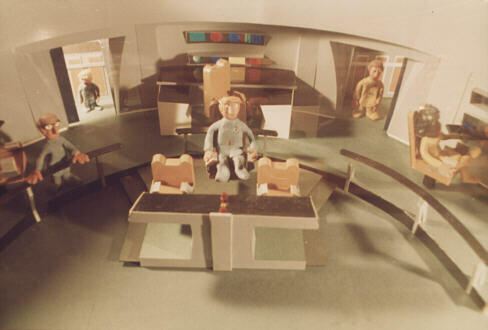 The search to find visual reference material of the new Trek's sets and models began as well as trying to make sense of the story. In the initial weeks following the film's release there was very little in the way of photos depicting the sets but eventually trade publications like American Cinematographer and the newly created Cinefex magazine (I still have issue #1) came to my rescue. There was even a book which told the story of the film in frame grabs called STAR TREK: THE PHOTOSTORY. This was a very valuable resource that I referred to constantly for questions on sets and effects. I sold off a number of my STAR TREK items in the early 1990's and this book was among them. Alas! 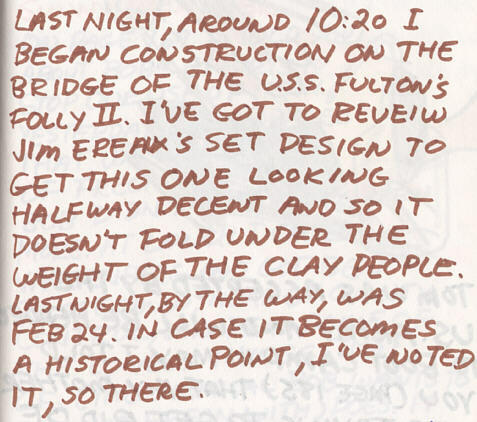 March 23, 1980 The bridge set was well underway. 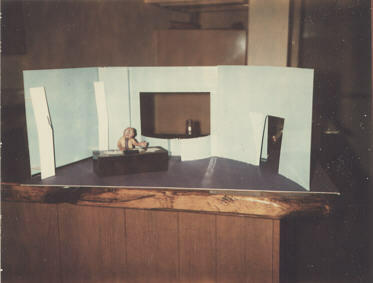 The front viewscreen section was built later. 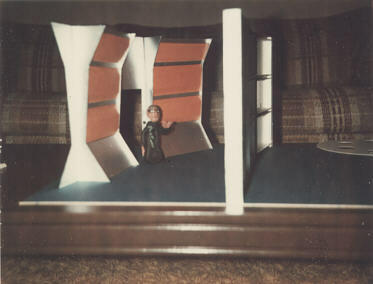 April 21,1980 The walls and consoles are up but the reflective copper doors would be repainted to dark gray. 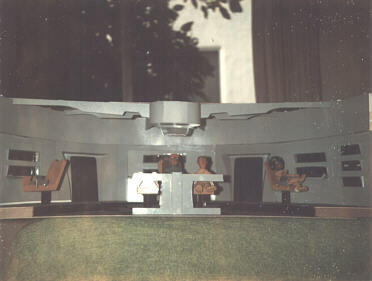 May 16, 1980 The bridge seating is in but the ceiling dome would have presented problems during animation and was rejected. Psst! It was made with a McDonald's sundae cup. 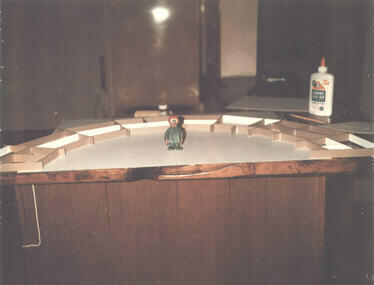 Late May, 1980 In town to see THE EMPIRE STRIKES BACK, Martin Baumgarten took some progress shots of the new bridge set. 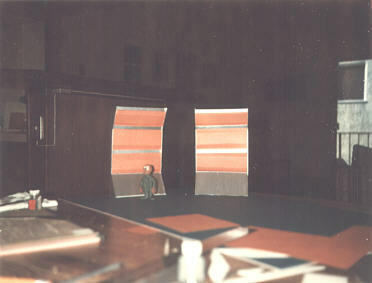 Martin snaps the bridge set in May 1980. The building of the first half of the bridge went on from February to May of 1980. 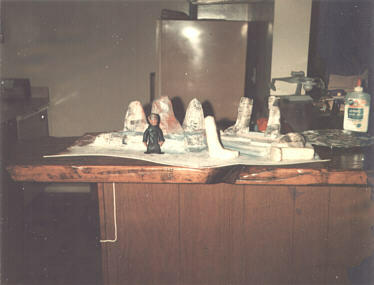 During the Memorial Day weekend, in between standing in line to see THE EMPIRE STRIKES BACK, Martin Baumgarten took some 35mm photos of the set with some of the clay characters posing. The next set was for a scene never included in STAR TREK: THE MOTION PICTURE but written in Gene Roddenberry's novelization of the story. It involved Admiral Klurk demanding command of the Fulton's Folly II from his superior Admirel Bullthrower. Since this was viewed as a suicide mission, Bullthrower was only too happy to give it to Klurk. 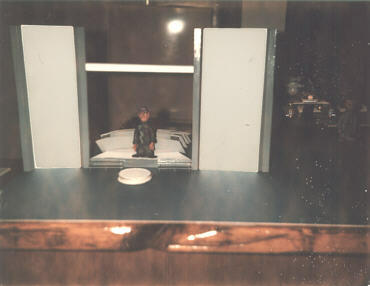 The admiral's office had already been an office set so it wasn't too much of a stretch to adapt it. Just as it was finished, I started the corridor outside the transporter room followed by the transporter itself. 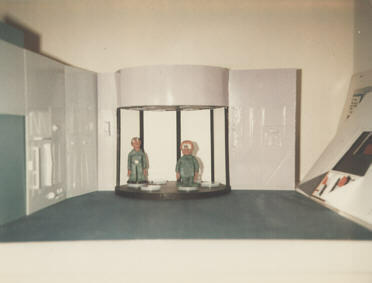 The beaming effect would no longer be done using bleach on the film and the pads would light up while it was in operation. 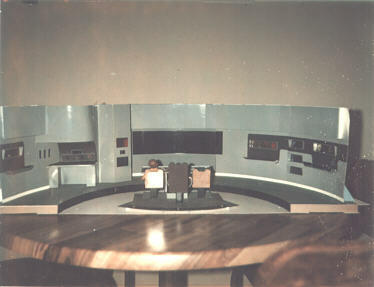 The viewscreen and weapons console for the bridge were started on October 26, 1980. This was followed by the Vulcan planet set in December. It was finished on January 5, 1981 but it didn't photograph as expected and was revamped in January 1984. Engineering and the outside corridor were started in March of 1981 but was halted due to disruption on the job front. The tenant of the pre-existing set refuses to leave during the modification to a Starfleet Admiral's office. The completed office with backlit screen and wall hangings courtesy of AMT model boxes. Also a Paul McCartney trinket from the VENUS AND MARS LP. The beginnings of the corridor outside the transporter room. Mr. Specks waves from the nearly completed corridor set. 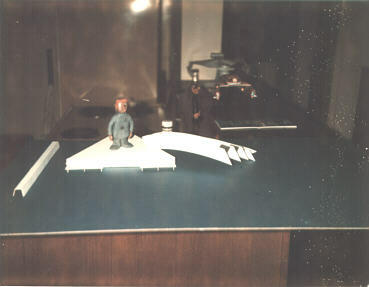 A visitor and Mr. Scotch pose on the incomplete transporter platform. Reflective auto decals add some glitter to the transporter. The peel-off letters are visible in some shots. Mr. Scotch gets in on the ground floor of the viewscreen half of the bridge set. 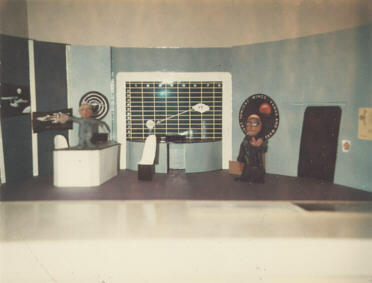 To the left of the viewscreen is the weapons station where Mr. Cowalski will be cubby-holed. The mountains and craters of Vulcan were molded of papier-mache but were later enlarged. 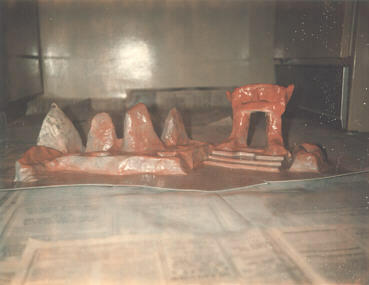 Although painted and camera-ready, the sets didn't photograph well and were re-worked a while later. 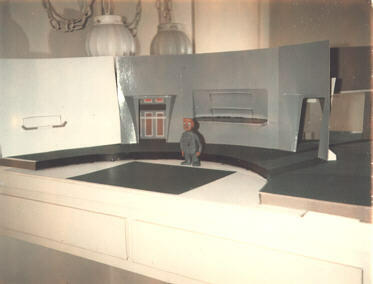 The engine room would employ the forced perspective trick that ST: TMP had used to make the set look longer. 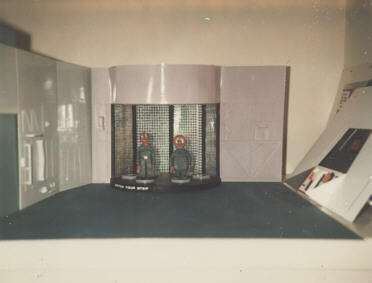 Construction on the engine room set was stopped before it got too far along in early 1981. 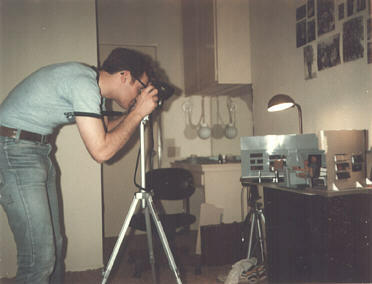 In early 1981, the lab was experiencing a sizeable dip in our work-print business. With the increasing refinements in videotape and smaller camcorders to shoot it, people were opting for the speed and and convenience of tape over film. The owner of Newsfilm hadn't counted on the swiftness with which video would invade film's domain and decided that with the loss in business our salaries would need to be trimmed accordingly. I had grown tired of the hot LA summers and the film business in general so I made some contacts at Vandenberg AFB to see if they might have any openings coming up. Construction on the West Coast Space Shuttle project was in high gear there and things looked promising. I made arrangements to stay at Gary (Capt.Coors) Loepke's place in Base Housing until I got situated. He and his wife Sharon were going on vacation so I mowed the lawn and kept an eye on the dog while they were gone. Not long after leaving LA and getting my belongings to Gary's garage, the federal budget was cut and the potential job openings at the base were eliminated. I was all moved up with no where to go.